NAIFA Idaho, Inc. is an Idaho non-profit association representing nearly 200 licensed life, health, and property/casualty insurance agents through its four member local associations located throughout the state. 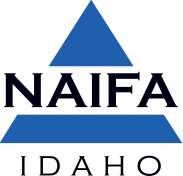 NAIFA Idaho is a state chapter of NAIFA. NAIFA (National Association of Insurance and Financial Advisors) comprises more than 700 state and local associations representing the interests of 200,000 members and their associates nationwide. NAIFA members focus their practices on one or more of the following: life insurance and annuities, health insurance and employee benefits, multi-line, and financial advising and investments. The association’s mission is to advocate for a positive legislative and regulatory environment, enhance business and professional skills, and promote the ethical conduct of its members.